Jami Gertz is an American actress and film producer. At the height of her career in the ’80s, she starred in many movies and TV series such as The Lost Boys, Less Than Zero, Crossroads, Square Pegs and The Facts of Life. Gertz is married to billionaire investor, Anthony Ressler and together, they have three children. Additionally, she and her husband are part owners of NBA side, The Atlanta Hawks. Since purchasing The Hawks, the actress has successfully worked as the face of the organisation. Find out more about the Hollywood star here, including her age, net worth, body measurements and more. Jami Beth Gertz was born on the 28th of October 1985 in Chicago, Illinois. The future Hollywood star grew up in Glenview specifically, covert road. As a child, Gertz took part in various school plays. While in the fifth grade, she played Dorothy in her class’ reproduction of the Wizard of Oz and made up her mind to become an actress. Jami Gertz completed her high school education at Maine East High School. For her college education, she studied Drama at New York University. Jami Gertz commenced her Hollywood career as a child actor, appearing in TV sitcoms such as Diff’rent Strokes and The Facts of Life. In a bid to further her career, she entered a talent hunt organised by renowned TV writer and producer, Norman Lear. This was in the early ’80s and she won the contest. Consequently, she was cast in the CBS sitcom, Square Pegs. The sitcom ran from 1982 to 1983 and focused on a bunch of awkward teenage girls trying to fit into their high school. After Square Pegs, Gertz started landing more roles. In 1987, she featured in two of her most enduring movies till date – Less Than Zero (where she starred alongside Robert Downey Jr) and Lost Boys (featuring the likes of Keifer Sutherland). In 1989, she featured in movies such as Listen To Me, Renegades and Silence Like Glass. 1996 was a good year for the Chicago native as she featured in the blockbuster, Twister. The movie, which was about a bunch of storm chasers researching tornadoes, made over $50 million at the box office and was the second highest-grossing movie of that year. Since Twister, Gertz has appeared in other movies such as Seven Girlfriends (1999), Lip Service (2001), Keeping Up With The Steins (2006) and Dealin With Idiots (2013). She has also appeared in TV series such as This Is Us, The Neighbours, Difficult People, Modern Family, Ally McBeal, Er and Family Ties. Jami Gertz hails from a conservative Jewish family. Her father, Walter Gertz, was a contractor as well as a builder while her mother’s name is Sharyn Gertz. Asides her parents, the actress also has two brothers named Michael and Scott. 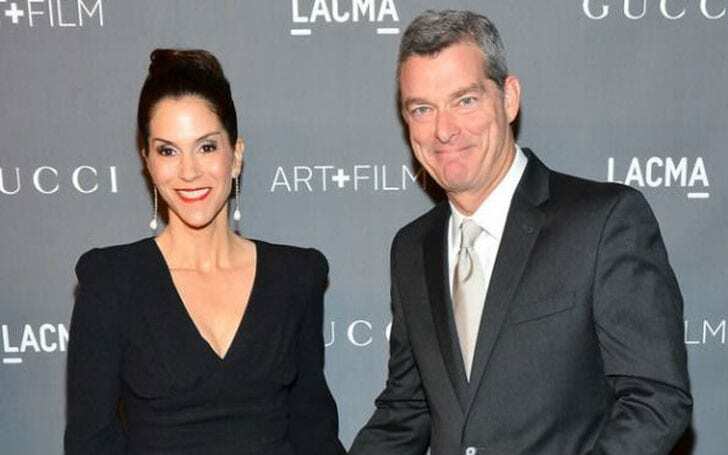 Jami Gertz is married to billionaire investor and businessman, Tony Ressler. He is the founder of two successful investment firms, Appollo Global Management and Ares Management. Gertz and her husband met in 1987 through her then-publicist who introduced them. It must be pointed out that she married him for love and not money. At the time they met, he was still building his career and didn’t have much. In fact, the actress was the person who paid for their first home. Gertz and her husband tied the knot on the 16th of June, 1989. They have three children together, Oliver Jordan (b. 1992), Nicholas Simon (b. 1995) and Theo (b. 1998). The actress’s individual net worth is not available. We, however, do know that her husband has a net worth of $2.1 billion, according to Forbes. Tony Ressler made his fortune from a successful career in banking and investment. He co-founded his first private equity firm named Apollo Global Management in 1990. Presently, he is the founder of Ares Management. Founded in 1997, Ares Management is an investment firm and manages assets surpassing $120 billion. As a testament to their fortune, Gertz and her husband are part owners of NBA side, The Atlanta Hawks. They purchased The Hawks in 2015. Gertz and her husband live in the Beverly Park, a gated community in Beverly Hills. Their neighbours include actor Mark Wahlberg, as well as a member of the Saudi royal family, Prince Nayef bin Ahmed Al-Saud.